Here is our very first blog post from 3 years ago. We posted quite a few for 2 years but we are taking a break from it for now. There are some fun and easy Halloween tips here. Take apeek and look at other posts as well! We have been thinking about blogging for years. I figured that the holidays would be a good time to start, as we always have lots of creative holiday ideas and there is a lot to write about. With that said, we are launching our HOLIDAY BLOGFEST!! Every week between now and January 1st we will post a blog about the holidays with ideas and other (hopefully) interesting content. Our focus is that creativity can be simple and affordable and it can make life more fun! 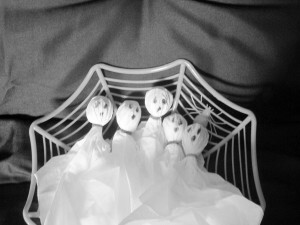 Craft tip: The little ghosts shown in the photo above are an easy party favor you can make. Wrap a lollipop with a white napkin. Tie with a ribbon or rubber band, use a marker for eyes, and you have cute ghosts. BOO! This entry was posted in Uncategorized on October 7, 2017 by roydrewartsetc.